The production of glucosamine may decrease as we age. There are no edible sources of Glucosamine - bound forms do occur in cartilage, but in meat this is gristle and we tend not to eat it. Glucosamine speeds regeneration - as long as your rate of repair keeps up with the rate of tissue loss. Reports have shown that glucosomine was beneficial for those that have osteoarthritis by improving the structure of the joints. Glucosomine is an amino sugar which builds connective tissue and healthy cartilage in our bodies. It is the essential building block of proteoglycans and other substances that form protective tissues. Without glucosomine in the body, everything from tendons to skin, nails and bones could not form in the correct way. The more wear and tear we put on our bodies, the more we need glucosomine for repairing the joints and surrounding structures in our bodies. If body chemistry is unbalanced, it may be that insufficient glucosamine is formed, which limits our ability to repair wear and damage. Glucosamine, which is naturally synthesised within the body but rarely found in natural food sources, provides raw material for the building blocks of cartilage tissue around joints. When there is excess wear, more raw material is needed for the joints and surrounding structures in our bodies. The micro fibres in our bodies are continuously being fragmented and then repaired. They give your body firm skin and support muscles, blood vessels and other organs. The biggest issue for the body is when the rate of fragmentation exceeds the rate of repair as connective tissues and cartilage start to lose their structure. We can see evidence of this is aging skin and the thinning of cartilage. Preventing this from happening means that we would need to increase the rate of repair in the body, and that largely relies on the rate that we can develop the amino sugar glucosomine. Our product can speed up regeneration of good tissue to keep us healthy. This is essential when you think that the entire human skeleton is renewed once every decade or so. Can we be short of Glucosamine? With the stresses of modern living and the imbalance of chemicals in the body, it is likely that we are going to need more glucosamine to repair damage. Additionally, the enzyme ‘glucosamine synthetase becomes less efficient as we get older, which slows the rate of repair. The elderly suffer most due to this effect. Vegan source Glucosamine Hydrochloride(from Aspergillus niger), Capsule shell, (Hydroxypropylmethylcellulose), microcrystalline cellulose. 1-3 capsules daily with food, or take as directed by a practitioner. 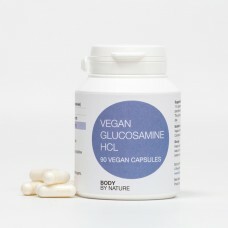 Suitable for Vegetarians and Vegans and for people with Candida and yeast sensitivities.